This TV uses 4K technology which delivers the highest level of resolution available in current television industry. This innovative technology brings to life vivid colors which look truly real and seem to kind of pop out of the screen. Sony really knows how to expand the viewing experience into a whole new dimension. As a smart TV, there is no doubt that this Sony model is equipped with loads of exciting and very useful features which will enhance your entertainment experience, as well. 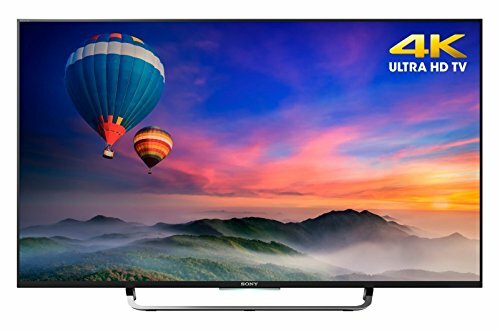 Overall, the Sony XBR-43X830C is a great buy that offers great viewing experience in addition to several inputs to improve your entertainment experience. Since this model is a relatively smaller screen, Sony left out some of the contrast and color-oriented picture improvements that their larger XBR models have. Still, this elegantly slender 4K TV delivers amazing 4K image quality. The secret is in the fact that this TV uses the same video processing as most expensive XBR models from Sony. To begin with, color, clarity and contrast are enhanced thanks to the new 4K Processor X1 engine while also enhancing the image quality of different streamed 4K content from providers such as Netlix. Another major ingredient is 4K X-Reality Pro upscaling technology from Sony. This technology analyzes as well as upscales incoming video to 4K, and ensures the best possible picture regardless of the source. Finally, this TV also boasts Sony’s Motionflow XR 960 blur reduction for maintaining motion clarity. The Sony XBR-43X830C allows you to enjoy the Android platform in a better way with this bigger screen. There are a lot of fun games, apps, voice and casting search functions available on this platform. Everything you enjoy watching or doing on your smartphone or tablet can now be done on this amazing TV. There is now also the voice search feature that allows you find what you want easy and fast by simply speaking into a compatible device or the optional One-Flick remote and you are set to go. This is a really cool feature that all the gamers will surely love. You have the possibility of streaming PS3 games thanks to the Sony’s PlayStation Now service. You can stream games directly to the Sony XBR-43X830C via the web, and you don’t need additional video game console. You can play and enjoy select PS3 games with no patches, downloads, trips, or installs required. You can choose between renting from a library of more than 200 game titles and subscribing in order to get instant access to a catalog of over 100 PS3 games. A Sony PS4 DUALSHOCK controller that is sold separately will plug into one of the USB ports on this TV. While at it, this TV boasts 4 HDMI ports and 3 USB ports which is more than enough for connecting all your devices to the TV.